Middle East expert Dr. Mordechai Kedar says New Right is party best able to advance and protect the State of Israel. 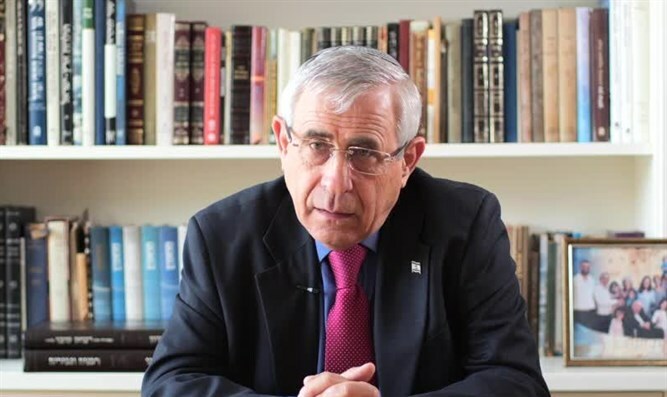 The New Right party on Wednesday morning published a video clip featuring Middle East expert Dr. Mordechai Kedar explaining why he supports New Right Chairman Education Minister Naftali Bennett and Justice Minister Ayelet Shaked. In the video, Kedar explains that there are two types of people involved in Israeli politics - "those who know the political quarrel-mongering well" and "people who are leaders, who think big and have a goal other than surviving in politics, people who see a future." Bennett, Kedar says, "is of the second type." "The New Right has two leaders - Naftali Bennett and Ayelet Shaked. Naftali is a man who says 'after me.' He doesn't say 'run ahead,' he says 'after me' - that's his personality. And she is a lady who speaks the truth. Bennett and Shaked, in my opinion, are a winning team." He also noted that the two are "people who are connected to Jewish tradition, proud of it, and willing to sacrifice themselves and their time on the altar of the nation." "Out of the whole range of Israeli parties, the New Right speaks to me the most, and their voice is the clearest," he said. "This is because of the amazing integration of the religious Israeli, the non-religious Israeli, the less religious Israeli, the absolutely not religious Israeli. We're all Israelis, we're all Jews. We have one country, and we need to advance it, to protect it, and to guard it from all ill.
"Out of the entire spectrum of parties, I think the New Right will do that best." Dr. Kedar is a Religious Zionist, Middle East expert, and a professor at Bar Ilan University's Department of Arabic. He is also a researcher for the Begin-Sadat Center and chairman of the Professors for a Strong Israel group, which often appears in Arab and international media. He is a Lieutenant Colonel (res.) in the Israeli army. Dr. Kedar also writes a weekly column for Arutz Sheva.